No one person or organization can fully support the efforts to save America's food traditions. That is why the RAFT partners have developed a variety of integrated projects, blending our respective expertise to develop programs that support farmers, chefs, breeders, producers and our food system as a whole. Below are some examples of the partnership's goals and projects. The RAFT Alliance brings local farmers, chefs, fishers, agricultural historians, ranchers, nurserymen and conservation activists together to exchange information, tell the stories of regional foods and food producers, and create publications. Through RAFT, these communities of food producers publish lists of traditional regional foods, telling readers the stories and threats to these foods, and where seeds, nursery stock, or seafood and livestock hatchlings can be purchased to aid in their recovery. The result is the growth of food-concerned communities that are reestablishing healthy local economies. This year, RAFT is focusing its documentation work on the unique and endangered foods of New England and the Great Lakes. To download and help expand RAFT's regional publications listing foods at risk, visit the Resources page. 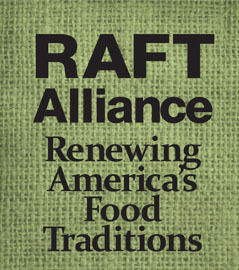 In 2008, the RAFT Alliance published the first book that addresses the current state of the culinary treasures unique to the North American continent. Renewing America's Food Traditions: Savoring and Saving the Continent's Most Endangered Foods was edited by Gary Paul Nabhan and published by Chelsea Green Publishing. To learn more about this book (and buy it), visit the RAFT Resources page. Building on the successes of seed banks such as Seed Savers Exchange and Native Seeds / SEARCH, who have prevented the extinction of thousands of heirloom fruit and vegetable varieties, RAFT coordinates heirloom food “grow outs” with sustainable market farms. These grow outs help restore regional foodsheds and local economies. To date, over 500 specialty growers around the U.S. have participated, sharing data on growing habits as well as providing ingredients for meals at restaurants, diners, and university cafeterias in communities throughout the U.S. This year, Chefs Collaborative is coordinating a grow out of sixteen New England heirloom varieties with farmers and chefs in Boston, MA, Providence, RI and Portsmouth, NH. Farmers will grow these varieties and chefs will feature these foods on their menus in and around Boston, Providence and Portsmouth this coming fall. Local Slow Food chapters will organize local events to promote these foods and encourage more local growers, chefs and retailers to grow, serve and sell these unique New England vegetables. To learn about the recent kick-off meetings with farmers, chefs and local partners, visit the Slow Food USA blog and RAFT in the News. For more information about the project, contact the Chefs Collaborative. Just as dozens of vegetables, corn and bean seed companies were consolidated and bought out by multi-nationals in the 1970s reducing the diversity available to the public, the same trend has been affecting the fruit and nut tree business since 1995. While there remain a few specialty houses that feature “antique apples” or “heirloom peaches,” they largely cater to a national audience of hobbyists and not to a place-based culture of fruit growers. At the same time, global climate change has induced severe droughts, floods and other catastrophic events, whittling down the number of fruit and nut trees still on the landscape. Native Seeds/SEARCH is leading RAFT trainings of heirloom fruit enthusiasts in the basic skills of cutting, grafting, documenting tree histories, and distributing scion wood of the most flavorful historic fruit varieties. Last year's workshops took place in Sturbridge, MA and Traverse City, MI. This March, Native Seeds/SEARCH hosted a workshop in Madison, WI. Another workshop is planned for later this year. For more information, view the Events page or contact Native Seeds/SEARCH. This year, RAFT is focusing its heirloom fruit recovery work on apples. To start, we brought together twenty heirloom apple experts from around the country for a day-long summit in Madison, WI to discuss the status of current grassroots efforts to conserve and promote heirloom apple varieties in North America and how to bring them back to our farms and tables. Learn more about this summit on the Slow Food USA blog, the RAFT Events page, and the RAFT in the News page. To see great photos and videos of the summit and accompanying events, click here. We are now compiling the first-ever national strategy for saving and restoring heirloom apples. This document --part manifesto and part manual-- includes a status report on apple conservation and loss, an assessment of causes of loss, and options for conserving remaining apples to bring back to the table as food and cider. To read the draft document, go to the RAFT Resources page. Modern food production favors the use of a few highly specialized breeds selected for maximum output in a controlled environment. As a result, many delicious, regionally adapted livestock breeds have lost popularity and are threatened with extinction. These traditional breeds are an essential part of the USA's agricultural inheritance. The need for livestock conservation is urgent. The American Livestock Breeds Conservancy (ALBC) leads the RAFT Alliance in documenting endangered breeds with the most commercial potential and working with their producers to restore historical levels of productivity and increase their numbers for sustainable distribution. Using a model developed with the Buckeye breed, ALBC is expanding its poultry breed recovery work to Delaware and Java chickens. ALBC is also focusing on Pineywoods cattle and rare swine breed recovery work. Chefs Collaborative and Slow Food USA are partnering with ALBC to ensure breeds are selected with thought to taste quality and chef and consumer preferences. To learn more about 2009 projects, contact ALBC. To learn about upcoming breeder and producer workshops, visit the Events page. The best assurance for continued diversity in our food supply lies in connecting the stories, flavors, fragrances and textures of these foods to larger audiences, so their eating, purchasing, and recreation habits once again support the food's producers. RAFT celebrations take many forms, from wild foraging expeditions to cooking demonstrations and picnics; from oral history kiosks to radio shows and classroom lessons. What anchors all our celebratory activities is a shared meal, which is the most pleasurable (i.e. effective) way to connect people to the who, what, where and why of their food. To this end, the highest profile projects to date have been “American Traditions Picnics.” These community events feature endangered American fruits, vegetables, meat and poultry identified by the RAFT Alliance, boarded onto the Slow Food Ark of Taste and grown by local farmers. For ideas on how you can get involved, click here. Slow Food USA's grassroots network of 18,000 members and over 200 chapters are a driving force around the country for organizing local projects and events that recover and promote endangered foods. Slow Food USA encourages its chapters to champion a place-based, endangered food that has an important connection to their community, and work to increase its production, distribution and consumption. That means encouraging farmers to grow/raise it, chefs to serve it, retailers to sell it, and consumers to eat it. Through these projects and events, they are not only recovering biologically and culturally important foods, but also increasing public understanding about the connection between food and place and the importance of biodiversity in a healthy, sustainable and secure food supply. Some of these projects are featured on the Slow Food USA blog (category: biodiversity). Learn more about our work through the many news stories that feature our activities and efforts.